Little Ice Age on the Way? She suggests it could be a repeat of the so-called Maunder Minimum – a period in the 17th century with little solar activity that may have influenced a cooling on Earth. Whatever we do to the planet, if everything is done only by the sun, then the temperature should drop similar like it was in the Maunder Minimum. At least in the Northern hemisphere, where this temperature is well protocoled and written. We didn’t have many measurements in the Southern hemisphere, we don’t know what will happen with that, but in the Northern hemisphere, we know it’s very well protocoled. The rivers are frozen. There are winters and no summers, and so on. So we only hope because these Maunder Minima will be shorter, the Maunder Minimum of the 17th century was about 65 years, the Maunder Minimum which we expect will be lasting not longer than 30-35 years. Of course things are not the same as they were in the 17th century – we have a lot more greenhouse gas in the atmosphere. And it will be interesting to see how the terrestrial and the solar influences play out. This is promising research – a new insight into our sun with predictions as to its future behavior, yet Professor Zharkova relates than some climatologists resented her discovery. What do you think? Are we on the cusp of the next little ice age? Previous Article Nearby supernovae could have affected life on Earth – Change Climate? So that article will be in my next copy of Science News ? I’ll be surprised if it is. I agree, It does not fit the going green narrative. Other than a ‘clean sun’, are there other observables that presaged previous Maunder Minima? It would be nice to see a side-by-side comparison of then and now if people are to be convinced one way or another. George, I am not aware of any other signatures for the Maunder Minimum, other then the lack of sunspots. Our science has progressed to where we can measure the magnetic fields on the sun. It is interesting that Penn and Livingston study a few years ago indicated a possible long term decrease in sunspots based on measurements of the umbrae decline. http://hmi.stanford.edu/hminuggets/?p=618 Penn and Livingston predicted no sunspots after 2017, then revised to 2020. Here is view of the current progression: http://www.swpc.noaa.gov/products/solar-cycle-progression. The science is building block by block for another grand minimum. Russ we need to get the word out that its going to get cooler and then warm again, nothing to do with CO2. el gordo, do you notice that your top graph is labeled “Glob Temp minus its quadratic fit curve” and “band pass filtered global temperature”? Grand Solar Min began 3 Years ago. 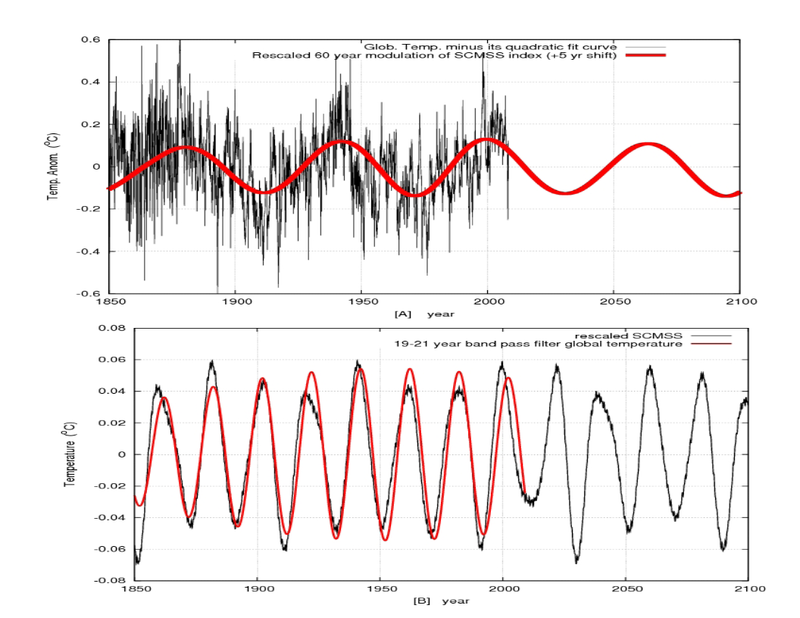 Will it be like Maunder Minimum?. What if it’s worse than 450yr is there a 5,000 yr or 100,000yr. There alot things were seeing for the 1st time with Technologies man has never seen inside our Galaxy or its sun before.or have we? I don’t buy Ancient Alien’s BS. Where is a citation for Dr. Zharkova’s peer-reviewed paper? Of course these solar cycles influence Earth’s temperature — and they will show up as modulations on top of the far more significant warming driven by anthropogenic greenhouse gasses. No, there will not be another Little Ice Age. Really, see the latest post. It is possible to explain the warming by the intensity of the cloud cover. Higher levels of solar activity reduce cloud cover, thus warming the planet with out regard to CO2 emissions.